Category: MIXERS - POWDERS / LIQUIDS / CREAM / PASTE /VACUUM 0ption. KEW has been a leading partner in process engineering technology for the pharmaceutical, cosmetic, food and chemical industries. 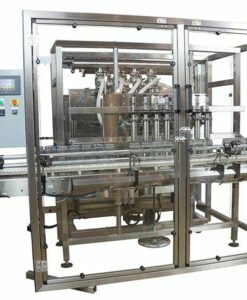 Our innovative and broad range of machines are used in a broad variety of applications, from ketchup and mayonnaise production to vacuum processing of pharmaceutical products. 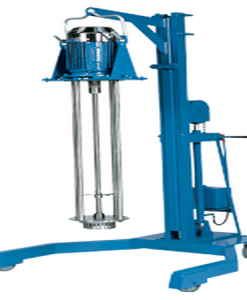 Intensive Mixing by means of semi-anchor mixer and efficient scraper system. Intensity of homogenizing can be regulated by means of adjustable grip between rotor and stator. Optimal vertical mixing as well as quick deaeration by means of mixing spiral. Clean and aseptic working as no seals in reach of the product. Clean air-free work due to vacuum application and closed system. Drawing-in of raw material directly into the turbine of the homogenizer by means of special sucking device. Vessel with double jacket in stainless steel inside and outside for heating and cooling by means of steam or electricity heated bath. The mixing vessel is manufactured entirely in stainless steel 304 / 316, inside as well as outside. The inside is high gloss polished, all welded seams are dressed and polished, the outside is matt polished.The vessel is connected to the robust machine frame (the structure and configuration of the mixer depends on its size, application and sometimes customer requirements.) and emptied through a bottom valve. The machine has a vacuum and pressure resistant cover; Vacuum up to . The cover is equipped with all necessary vacuum and pressure fittings. The cover is moreover equipped with a light and sight glass as well as with a lamp. The necessary pressure clamps are mounted on the cover and part of our standard supply. The cover is also equipped with a device which feeds fluid or powdery raw material directly into the homogenizer. The cover is provide with a spring loaded hinge and can be opened with one hand. The machine frame is made of rectangular profile structure steel and sprayed with blue or white paint. Other colours can be supplied on upon demand. The vessel is fixed on the machine frame and the latter does not have to be fixed to the floor. The machine is provided with a control panel box which contains all electrical functions. The standard machine is equipped with a thermometer in the product area, but a temperature control can be supplied. The latter consists of a temperature probe in the product area which commands a motor valve at the entrance socket of the double jacket by means of a requlator. 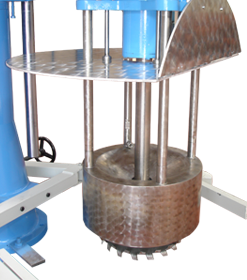 The machine is provided with a slow speed semi-anchor mixer which is fixed with bearings on a rigid column in the center. In order to make the opening of the cover possible, the motor was placed under the machine. There are, however, no seals or bearings in reach of the product. The anchor, which assures an optimal, horizontal mixing of the product is equipped with a moveable teflon scrappers. These can adapt themselves individually to the wall of the vessel and thus guarantee an optimal scrapping of the vessel and a quick temperature exchange between the product and the liquid contained in the double jacket.The anchor feeds product into the high speed disperser blade and ensures that the mixture is constantly in motion. The anchor can be provided with scrapers to remove materials from the interior vessel walls to enhance the heat transfer capabilities of the mixer. The key to creating finest emulsion is to creat finest possible droplet size. The more the energy in the mix, the smaller the droplet size in emulsion, creating fine emulsion.high shear batch mixer doesn’t simply mix; it emulsifies, homogenizes, solubilizes, suspends, disperses and disintegrates solids. Each mixer, with its precision-engineered Silverson rotor/stator workhead, far outperforms conventional mixers, cutting processing times by up to 90%, improving quality, product consistency and process efficiency. The high-speed rotation of the rotor blades within the precision-machined mixing workhead exerts a powerful suction, drawing liquid and solid materials upwards from the bottom of the vessel and into the center of the workhead. Centrifugal force then drives materials towards the periphery of the workhead where they are subjected to a milling action in the precision-machined clearance between the ends of the rotor blades and the inner wall of the stator. This is followed by intense hydraulic shear as the materials are forced, at high velocity, out through the perforations in the stator and circulated into the main body of the mix. The materials expelled from the head are projected radially at high speed towards the sides of the mixing vessel. At the same time, fresh material is continually drawn into the workhead maintaining the mixing cycle. The effect of the horizontal (radial) expulsion and suction into the head is to set up a circulation pattern that minimizes aeration caused by the disturbance of the liquid’s surface. The purpose of the mixing spiral is to intensify the vertical mixing of the product and thereby ensure a better and quicker de-aeration. 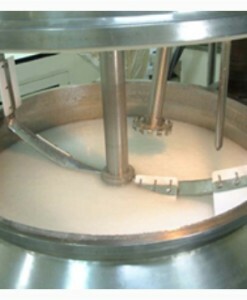 The mixing spiral transports the product from the bottom of the vessel to the surface of the vacuum zone, where it is continuously de-aerated.With this triple mixing system a separate or subsequent de-aeration of the system is not necessary, Mixing, Hmogenizing, Heating, Cooling and de-aeration all takes place in one operation. Fluid to pasty products can be processed. The Multi-Homo type Super-Duomixer is also able to quickly disperse considerable quantities so that a fine and completely air-free mixture is produced.We are specialist in mixing and homogenizing systems, batch and continuous production installations and would be pleased to your partner in the planning and construction of your production equipment. The blade creates a vortex that pulls in the contents of the vessel to the blades sharp edges. The blade surfaces then mechanically tear apart solids thereby reducing their size, and at the same time dispersing them among the liquid used as the carrier fluid. High Speed Dispersers are ideal for dispersions that are up to a maximum of approx. 50,000 centipoise. Heating Method Steam, Thermal Oil, Electric Heater. Industry Suspensions, Dispersions, Creams, Emulsions, Pastes, Syrups, Suppository substances, Ointments. Cosmetic Industry Creams, Sun-protection products, Perfumes, Emulsions, Tooth-pastes, Shampoo, Conditioners, Gels, Lipstick mass, Skin Complexion make-up, Mascara, Fluid or pasty eye-lid shadows, Collagen suspensions, Carbopol emulsions etc. Chemical Industry Grease, Photo Emulsions, Shoe-creams, Technical Emulsions and Mixtures, etc.